Clean driveways, sidewalks or other big projects faster and easier. 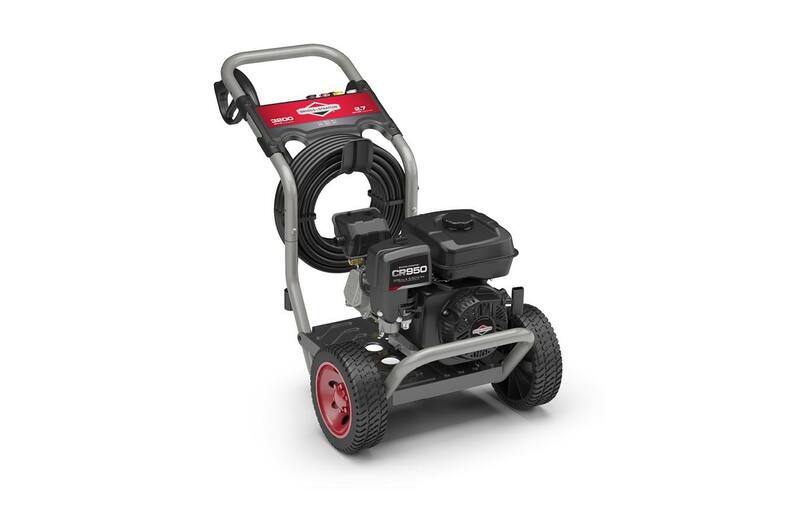 Briggs & Stratton CR950 Series™ OHV Engine (208cc): This engine combines professional-grade power and performance with easy-to-use features homeowners want: strong, quiet and durable. Heavy-Duty Maintenance Free Axial Cam Pump with Easy Start™ Technology: This pump is specially designed for high-performance, high-pressure output and easy, low-effort starting. 30 ft. High Pressure Hose: Lets you clean further without having to move your pressure washer. Detergent Injection System: Lets you siphon cleaning solution into the water stream for even faster and easier cleaning. High Temperature Thermal Relief: Helps protect the pump from damage by automatically purging overheated water. 10" Never Go Flat Wheels: For added mobility over rough terrain.